To celebrate US Memorial Day (the last Monday in May), MyHeritage is offering free access to the US military records they hold until midnight on 28 May. For those of us in Scotland, I think that will be until early morning on 29 May. Memorial Day is like our Armistice Day in that it's the day that Americans remember especially family members who are serving in the military and those killed or injured while serving in the armed forces. It's a public holiday, and many treat it as a holiday long weekend. Their US military records seem to include Revolutionary War pension records, various Civil War records, various World War II records and some post-World War II records. Search the US military records. Be aware that your search results may contain results relating to records that aren't free. 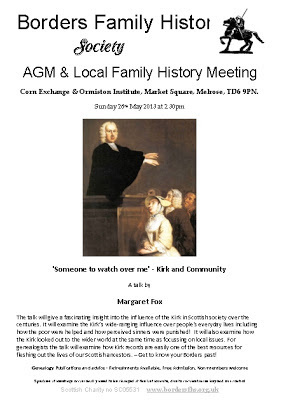 Our next meeting is on Sunday 26th May at 2.30pm in the Corn Exchange, Market Square, Melrose, TD6 9PN, when we have Margaret Fox, whose talk is titled 'Someone to Watch Over Me: Kirk and Community’. 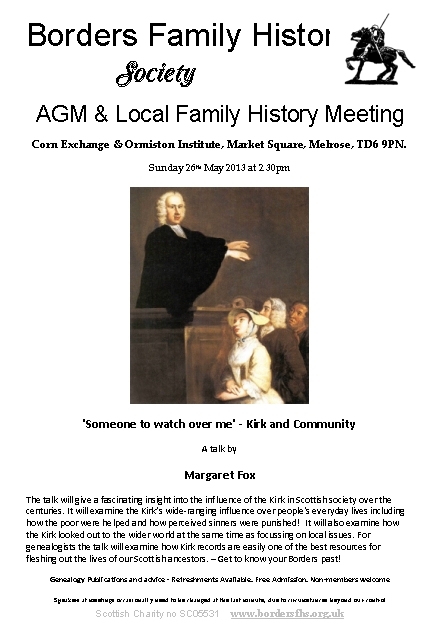 I think her talk will give a fascinating insight into the influence of the Kirk in Scottish society over the centuries. It will examine the Kirk’s wide-ranging influence over people's everyday lives including how the poor were helped and how people perceived as sinners, were punished. She will also reveal how the Kirk looked out to the wider world at the same time as focusing on local issues. For genealogists, the talk will demonstrate how Kirk records are easily one of the best resources for fleshing out the lives of our Scottish ancestors. You might remember that Margaret Fox and Catherine Maxwell Stuart delivered a very interesting talk with nice slides to us, last October at Innerleithen, about their book 'A Family Life Revealed: The Stuarts at Traquair 1491 – 1875'. The talk is preceded by our AGM at which I’ll be reviewing our year. I warmly invite you to attend the talk and the AGM whether you are a member or not, though you cannot vote if you’re not a member. The doors will be open at 2pm; the talk begins after the AGM, which usually takes about 25 minutes. Admission is free, so we hope to see lots of you there. We'll have a range of family history and other publications to buy. As usual there’ll be tea, coffee, and biscuits available after the talk. We’ll also be making the monthly 50-50 draw at the meeting. If you have a problem with your family history or you need advice about any aspect of your family history, please discuss it (no charge) with one of our volunteers. 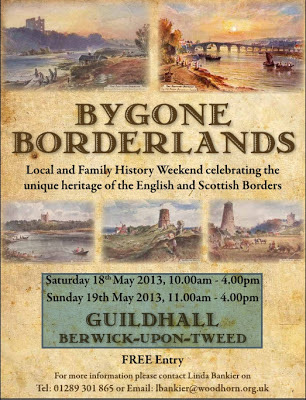 This weekend, 18 and 19 May, there’s a local and family history weekend organised by Berwick Record Office celebrating the heritage of the Scottish and English Borders and commemorating the battle of Flodden in 1513. The weekend event is called Bygone Borderlands and takes place in the Guildhall, Berwick on Tweed, England. On Saturday it runs from 10am to 4pm and on Sunday from 11am to 4pm. There'll be an archaeological tour of the jail area of the Town Hall, led by Jim Herbert at 12 noon on Saturday and 2pm on Sunday. I've commented several times about how useful newspapers are in fleshing out your family history and in my case, at least, in discovering new ancestors. A Black Sheep in the Family ? Lots of other British newspapers can be found in the British Newspaper Archive. If you come to our History Fair in Galashiels on Saturday, 11th May, you can get 15% off the British Newspaper Archive's annual subscription saving you almost £12. Entrance to the fair is free ! ScotlandsPeople's newsletter today announced that they're currently working on digitising the 1895 Scottish Valuation Rolls and they will be launched soon on their website. These Valuation Rolls could help you to corroborate information about people in the 1891 census. The 1905 Valuation Rolls and the 1915 Valuation Rolls are already available. They're looking for people whose ancestors appear in the 1891 Census, but have disappeared from that address in the 1901 Census so that they can cite them as interesting examples when they launch the 1895 Valuation Rolls. They'll try and find those ancestors for you, by searching the 1895 Valuation Rolls. So if you think that the 1895 Valuation Rolls might well contain a missing ancestor of yours, then please drop them a brief email at press AT scotlandspeople.gov.uk. Come and see ScotlandsPeople at our History Fair on 11th May 2013 in Galashiels, Scotland. Please note that online booking for our Family History Conference and Fair has closed. More information about the Conference programme.